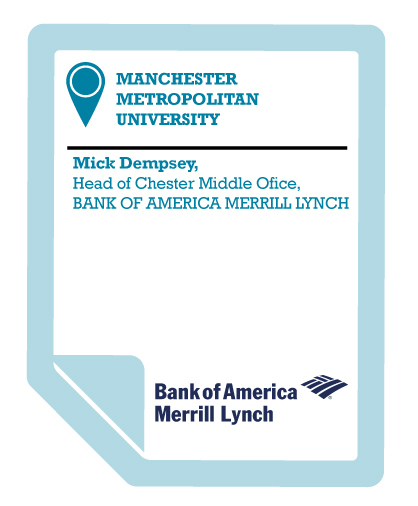 Bank of America Merrill Lynch operates in more than 90 countries around the world. Our mission is to partner with employees, clients and stakeholders to help make financial lives better. In everything we do we are committed to a diverse and inclusive workplace. This gives us the business advantage of understanding and meeting the needs of our diverse clients and communities. In our Chester office, in addition to our credit card business, MBNA, we have a large and growing Global Technology and Operations division. Over the past three years, we have experienced significant growth in this part of our business, and are able to offer an increasing number of graduate-level opportunities. Our contact with Manchester Metropolitan University began when we were invited to join an employability forum at the University. I liked the fact that they had team members there talking to a broad variety of employers – from small local companies, to large global organisations such as ourselves. Much of the discussion focused on questions to these companies about where they thought the skills gaps lay in the graduates being recruited, and how the University team could “raise their game” in preparing and supporting their students in their career search. At this event, and others since then such as Graduate Fairs, I’ve been very impressed by how open and responsive the MMU team is to feedback. With these open channels of communication, and a few tweaks being made to the format of the events, we’ve seen a huge improvement in students’ skills and attitude. I’ve been very impressed by the interactive and targeted results-driven nature of Manchester Metropolitan University’s student events. They’ve done things like breaking up the standard fair and incorporating “speed networking” activities which are engaging, relaxed, and where students feel they can ask more questions; this promotes discussion and leads to better outcomes for all. Today, we leave their events with a list of people we want to see again – and it’s us who follow up with them, which is quite a reversal of past roles! We’re growing our site here in Chester, and we are very focused on recruiting talented individuals who want a fulfilling career, not just a job. In return we offer significant, in-depth training and a wide scope of development programmes that help shape their futures. MMU is today putting its students in a really strong position to begin a career with us. Their proactive nature is refreshing and I’d encourage other employers in the North West to work with them.